UNESCO World heritage town Conwy carries a buzz that is a fusion of ancient history and bustling boutique shops, all set within castle walls and against the backdrop of pastoral beauty. Dave Rothnie reports. Conwy is best known for its castle. Its presence dominates the spectacular view as you approach the town from the suspension bridge over the River Conwy. But take a walk around and it becomes clear that while the castle is the focal point, there is much more to discover within the town’s fortified walls. And walking is the best mode of transport to truly enjoy what the town has to offer. The tourist information centre offers a handy town trail to ensure you enjoy all that the town has to offer on foot. 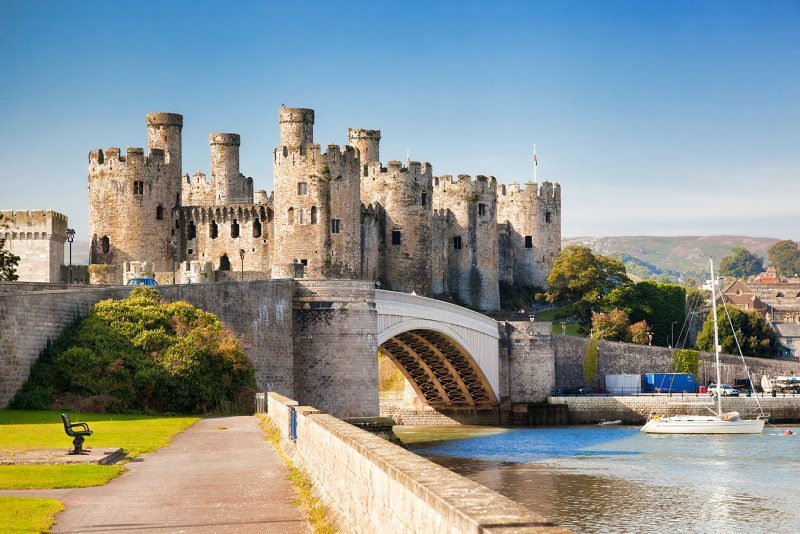 But to see Conwy in all its glory, then start by climbing the stone steps up to the castle walls, which extend for three-quarters of a mile around the town and include 22 towers. The battlements are intact from the 13th Century when they were built along with the castle itself by King Edward as part of the iron ring of fortresses surrounding Snowdonia. A glance down reveals an extraordinary range of historic buildings, cobbled streets, places to eat and stay, and a wealth of boutique shops all bursting with individuality and character. This month, the quayside will be teeming with nautical activities with a week-long River Festival featuring boat and yacht races as well as shore-side entertainment for the family. Meanwhile, theatre lovers can bring a chair and a picnic and spend a glorious summer’s evening at Conwy Castle watching an outdoor production Shakespeare’s comedy of error. But you don’t need to make a special date in the diary to enjoy what the town has to offer and aficionados have made their own trails. Starting down at the quayside, visitors can watch boats catching the world-renowned Conwy mussels, or simply watch the world go by and enjoy the views across to Deganwy. Within a short stroll is the High Street, which contains a dazzling array of shops to suit every taste – pottery, books, art, flowers chocolate, wine and speciality tea and coffee all fight for attention on the cobbled pavement up to the town square, which features a statue of Llywelyn ap Iorwerth (or Llewelyn the Great) who stands proudly above a fountain painted in his heritage colours. The town is easy to get around, and families should head to Yesteryears, a traditional toy shop, as well as Parisella’s ice cream parlour, to keep the little ones happy. There’s even a Knight Shop selling uniforms, swords and shields for the budding Glyndwr. Points of interest are scattered throughout the town, such as Aberconwy House, a rare 14th Century merchant’s dwelling, or Plas Mawr, the UK’s best preserved Elizabethan town house. At peak times down at the quayside, the longest queues are often for The Smallest House, a brief but memorable viewing that lives up to its name. When the feet get tired there’s an abundance of cafés, pubs, and restaurants to relax in. The town boasts more than half a dozen pubs, each with its distinctive character, and all of which have been recently refurbished. The town may be steeped with history, but its louche past and dingy haunts are firmly behind it. Visitors can grab a bite to eat in the town’s numerous cafés or for those preferring a snack on the go, there’s a choice of three fish and chip shops, or you can drop into the award-winning Edwards of Conwy, one of the most famous butchers in Wales, for one of their formidable meat baps. You’ll often find yourself in the queue with serious-looking walkers, calling in for sustenance after a brisk hike to the top of Conwy Mountain, reachable in just 30 minutes from town walls. If you want to savour the aesthetic, then the take a stroll round the art galleries and pottery shops, or head to Seibiant, where you can sample and buy speciality teas and coffees from around the world. Seibiant – meaning ‘a pause’ in Welsh – is a relatively new arrival on the scene and it joins Vinomondo, a specialist wine merchant and the Cheese Room delicatessen as must-visit destination for food and drink fans. With a broad range of accommodation, from B&Bs to self-catering cottages as well as two hotels, Conwy is an ideal base from which to visit the surrounding attractions, with the RSPB reserve within shouting distance and the spectacular Bodnant Gardens a ten-minute drive down the road. Conwy thrives on its variety and the emergence of new shops among the established names, keeps everyone on their toes and burnishes the palpable sense of civic pride. Perhaps the only surprise for such a popular destination is that the town’s train station is a request stop. Then again, perhaps that helps to preserve the mystique.